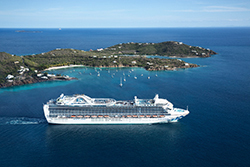 Ruby Princess® is a luminous jewel on the seas and a romantic destination in itself. Christened by lovebirds Trista and Ryan Sutter of TV's The Bachelorette, she offers nearly 900 balconies from which to view the world, an array of entertainment options including Movies Under the Stars,® and sumptuous dining choices from Crown Grill℠ to the International Café. *Amenities may not be combinable with all fares shown. Additional restrictions may apply.